It’s almost here–the BIG day you have been planning for over a year!! Don’t let the day be stressful and you miss out on the amazing moments you will cherish for a lifetime…enjoy these 10 Tips for wedding day bliss! Keeping Mothers Happy – A thoughtful gesture to include the Mothers in a special way at the ceremony is to present them with a single flower; the Bride presents the Groom’s Mother while the Groom present’s the Bride’s Mother with a single flower, say, a rose. Another great offering is to give a flower arrangement, such as an altar arrangement to each of the Mothers at the end of the day. 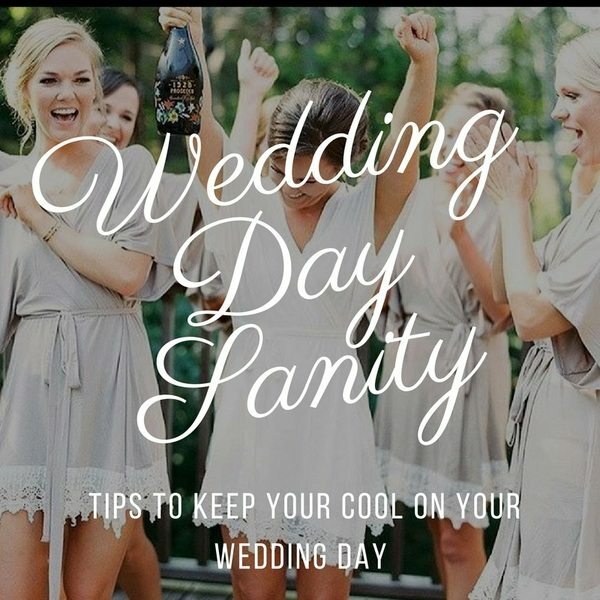 Pamper Yourself — Let the day of your wedding be an enjoyable time with your family and friends. Don’t plan every second with something that has to get done — even if it’s hair, nail and makeup appointments. Plan some down time, power nap, or relax with a cool beverage. Your Guests – Your wedding day is all about you and your new husband, but keep in mind you are the hosts and you need to accommodate your guests. Having a few designated “host/hostesses” is a great idea to manage any last minute requests by your guests to make them feel welcome. Nourishment — Have light, healthy snacks available while everyone is getting ready for the wedding (and don’t forget about the guys). This will keep everyone happy and content. Wrist Corsages – All the movement and bumping wrist corsages endure on an active wrist makes for a fragile item. Attaching the wrist corsage to the wrist of the opposite hand you write with (or dominant hand) is best. Or, opt for a pin-on corsage and have the ladies wearing corsages master the “side hug.” Another tip: Your corsages and boutonnieres have been out of water the longest, making them more fragile, so keep them in the refrigerator and don’t have them pinned on until absolutely necessary. Carrying Your Bouquet – Chances are you’ll be a little tense when walking down the isle. RELAX! Take a deep breath and let your arms rest at your hips. Most dresses are designed for you to showcase the bouquet at this area; otherwise, you’ll hide the beautiful design of your dress (with your bouquet), which is why you purchased it in the first place. Allow your bouquet to compliment your dress and become a part of the entire look, not over-shine your dress. Eat During the Reception – Sure, there is a lot going on and Aunts and Uncles to see. However, don’t forget to eat! You and your new husband need to enjoy all the elements of your wedding, especially the food. Bon Appetite! Wedding Goodbyes – Your guests may not be the night owl you are and may want to leave before you. If you want a grand farewell, plan that into your day so that everyone will be there to see you off. It’s Your Wedding – You can honor old traditions and create new ones. This is YOUR day, enjoy it and make it memorable!